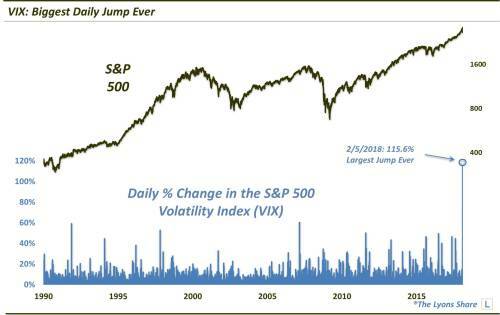 From Dana Lyons: By any number of metrics, the stock volatility market just experienced its most spasmatic episode of all-time — what does it mean for traders and investors? The stock market events of the past week certainly qualify as one of those memorable episodes in the annals of Wall Street, even for those of us with decades of time in the grind. And when it is all said and done, this particular set of circumstances will be remembered as a volatility event. Yes, many observers are rightfully focused on the events surrounding volatility-based exchange traded products. Whether they were the genesis of the past week’s market action or merely added fuel to the fire, there is no doubt that they played a significant role. And as many folks have warned, this enigmatic slice of the trading world has now undergone the reckoning (or the start of it) that has seemed all along to be its inevitable fate. We’ll let others opine further on that subject, though. The focus of this post is the extraordinary (and, of course, not unrelated) action in the spot volatility market and the associated metrics. These tools, e.g., the S&P 500 Volatility Index, or VIX, and other derivatives, can serve as valuable stock market indicators, especially as it pertains to sentiment. They are particularly helpful when registering extremes like they did yesterday. We’re going to take a look at 3 such examples of historic readings from the volatility market. The first comes from the VIX itself which soared yesterday by more than 100%. That was the first time in the history of the current iteration of the VIX going back to the early 1990?s that it actually doubled in one day. In fact, there have been just 3 other instances of even 50% daily jumps. This was not your ordinary volatility spike. The 2nd example of yesterday’s historic day in the volatility market involves action in the term structure of the market. Specifically, we are looking at the relationship between the 9-Day S&P 500 Volatility Index, “VXST”, and the 1-Month “VIX”. Typically, when traders get nervous, the will bid up the near-term vol instruments faster than the later-dated ones. And when the relationship gets extreme, i.e., when the closer index moves above the longer-dated one, it can be a sign of excessive fear, and a potential harbinger of an approaching stock market bottom. You can say that yesterday’s vol term structure registered an extreme “fear” reading. That’s because, not only did the VXST:VIX ratio climb above 1.00 – it hit 1.59. That smashed the prior record high reading of 1.41, going back to the inception of the VXST in 2011. That is some fear right there. Lastly, since we are talking about volatility in the markets, and about the volatility market itself…let’s take a look at the volatility of volatility. Yes, even the VIX has its own Volatility Index, known as “VVIX”. As it implies, the VVIX measures volatility expectations on the VIX. 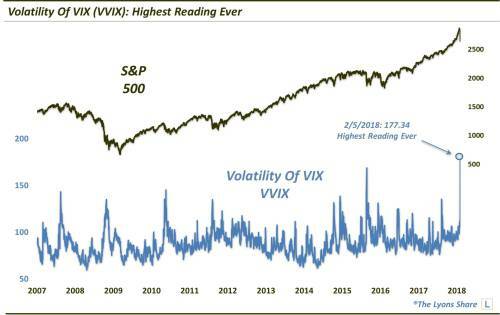 And judging by yesterday’s reading, volatility expectations for volatility have never been higher, as the VVIX came in at an unprecedented 177.34 reading. So what does this epic episode in volatility mean for investors? 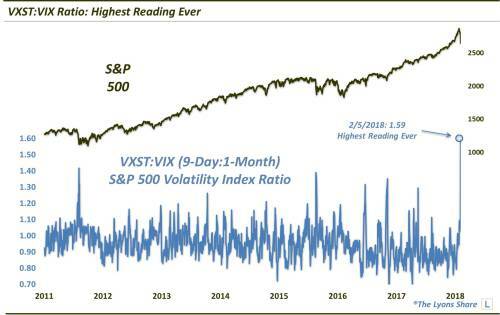 Well, as we mentioned, when these types of volatility metrics get elevated, it can be a signal of heightened fear on the part of stock market participants. And as Warren Buffett once said, it is wise to be “greedy when others are fearful”. Is that the case now? Or are the mechanics of the volatility ETP market distorting the sentiment picture here? We address that question a Premium Post at The Lyons Share as we take a deeper, statistical look at similar historical episodes involving the volatility indicators presented above. The iPath S&P 500 VIX Short Term Futures TM ETN (VXX) rose $1.95 (+4.38%) in premarket trading Thursday. Year-to-date, VXX has gained 59.63%, versus a 0.30% rise in the benchmark S&P 500 index during the same period. VXX currently has an ETF Daily News SMART Grade of D (Sell), and is ranked #5 of 14 ETFs in the Volatility ETFs category. If you are interested in the Premium version of our charts and research, check out our “all-access” service, The Lyons Share. You can follow our investment process and posture every day — including insights into what we’re looking to buy and sell and when. Thanks for reading!